Are you stuck with Instagram? Not getting the return you hoped for your business? Instagram is growing 5x faster than other social networks and 70% of users search for businesses every day on Instagram. Join us for an exclusive workshop with marketer, blogger and presenter Emily Osmond. Named in Domain’s Top 10 Interiors Instagrammers, Emily will share the 7 key elements of a successful Instagram strategy. 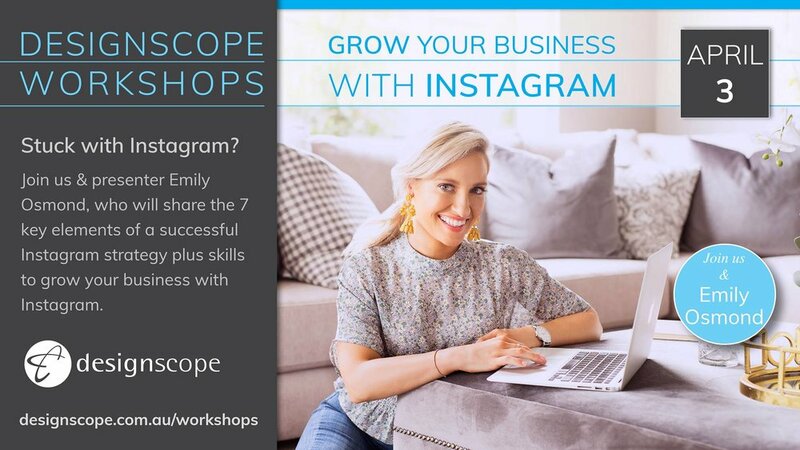 Ask your questions, receive feedback and learn the practical skills to grow your business with Instagram. Designscope have been producing communication strategy and graphic design for over 25 years. They built their first website in the mid 90's and are experts in both digital communications and print collateral. A tight team of 6, they operate from a large converted warehouse on the edge of Daylesford in regional Victoria. They love to collaborate with a range of other industry professionals, opening up their studio for networking events, share office spaces and a new series of workshops and talks throughout 2019. Up to 7 days beforehand OR you can transfer your ticket to a friend. Please email info@designscope.com.au to advise the name of the new attendee.